Purple, Orange, Limey Green with touches of black and white. These seem to be the preferred colors of Halloween, at least, in recent years. I "heard" someone ask online the other day, "Why purple for Halloween?" I don't remember seeing an actual answer to that query. But that's the way it is. 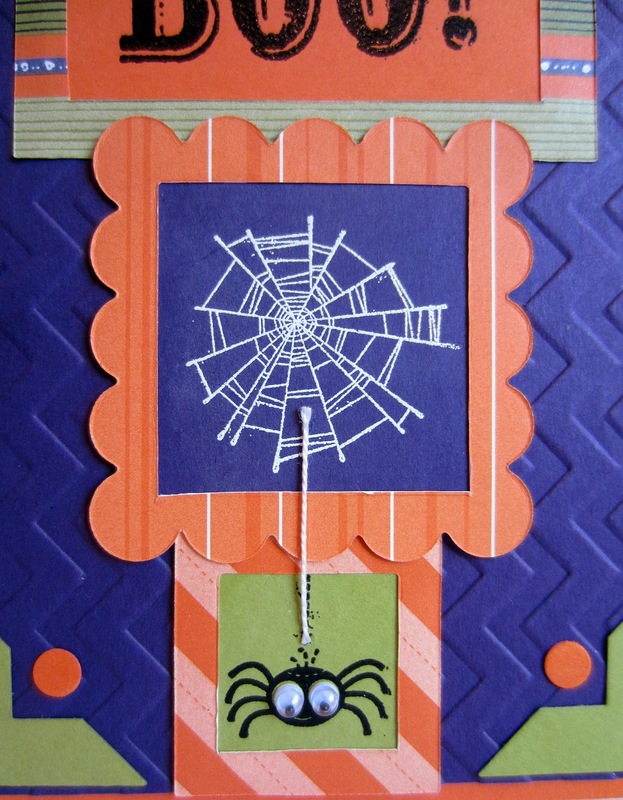 And that's the color combination I used in my Googly Spider card. With no real ideas in mind, other than to attempt using the old Bigz die, Peekaboo Frames, I headed down to my Creation Station to make a Halloween card. Talk about needing to plant Paper Seedlings! Do you remember that die -- Peekaboo Frames? It was a die that Stampin' Up! released a few years ago to go along with the Advent calendar idea where each of the cute closed frames was numbered 1-25, and the little flap doors could be opened on the appropriate day to reveal a seasonal image inside. I own that die and have not used it more than a handful of times. I have several little Stampin' Up! Halloween images that I've collected over the years, and thought some of those would be cute to live behind closed doors until the receiver opens and releases each of them. After making all the frames, I decided that they were not what I'd wanted after all. But I still liked them as FRAMES. I am a photographer, and frames are a necessary "evil" for photographs, at least, those you print out. So, I decided to cut off the doors -- GASP! -- and use them just as frames. My idea was to have a wall full -- really a card full -- of frames holding spooky images. After laying out this plan, I realized that my card would have to be much bigger than I wanted. I apologize that the only current Stampin' Up! product, besides the cardstock, is the Chevron Embossing Folder, which I thought was perfectly spooky for this card. Guess where the "BOO!" came from! 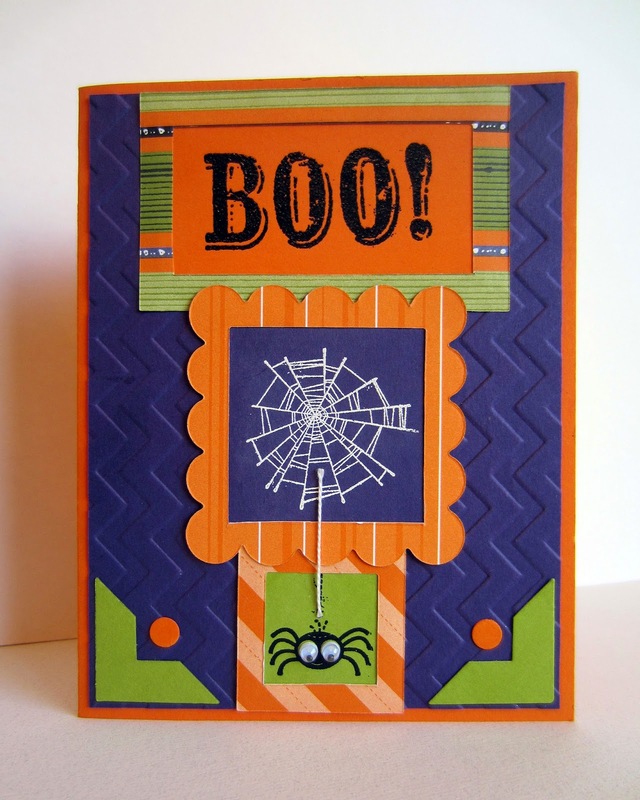 Uh huh, from the September 2014 Paper Pumpkin kit! See how glorious it is to receive Paper Pumpkin each month?!? You have a plethora of wonderful exclusive stamps to use forever! Dangling from a real thread off the spider web from Wicked Cool is the googly spider from Googly Ghouls. Of course, I had to spookify the spider by adding REAL googly eyes! The BOO!, the web and that scary spider were all heat embossed. I had called the card finished once I had the framed images on the chevron background. There was just something missing though. I set the card nearby and glanced at it here and there for awhile. I hated the vast amount of purple in the background. I think it was because I had done my frames "backwards", in an unexpected arrangement: largest down to smallest. It was way too top heavy. But I just didn't know how to fix it. I thought about drawing squigglys along the raised chevrons. How about a triangular green shape on the lower corners of the card? Eeeek! Not the answer. Finally, I came up with the perfect solution: I added the green photo corners and dotted them with orange circles. I was in happiness heaven! So tell us: Do you ever think a project is complete, then you take a good, careful look at it, and realize that something is missing? So, with the realization that your project is actually not quite finished, you went back to the drawing board and tried various "solutions" until you were satisfied when you finally did consider it finished? Is this a frustrating problem for you in your creative endeavors? And, by the way, does anyone know the origins of the colors of green, orange and purple being used in depicting Halloween? Hope your Halloween creations are coming along just spookily. And that you are enjoying this glorious season of Fall! I commented, but not sure if it went through. Let me know if I need to do it again. Looks like the spider ate my original comment. I said that I think the corners and circles balance the card perfectly and make it even more fun! I think Halloween colors originated when marketing people realized that color sells -- so orange for pumpkins, green for Frankenstein/monsters, and purple as a lighter shade of black. Plus the colors look spooky together! Super cute! I don't think you should apologize for not using the most up to date products though. I think we all have a pile of past papers that need using up. Thanks so much for linking up at the Make it Monday Party! Hope to see you again next week. Your card is really cute and I still have all the stuff to make my own too. I love this card. It is too cute for words. Thank you for sharing it on Show Me Saturday! Linda! Such an adorable Halloween card you made. Thank you so much for linking it up with us. The party is not the same without you. Tomorrow a new party. Cant wait to see what you'll bring us again!